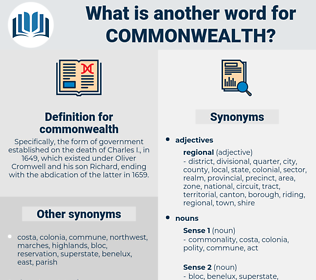 What is another word for commonwealth? Specifically, the form of government established on the death of Charles I., in 1649, which existed under Oliver Cromwell and his son Richard, ending with the abdication of the latter in 1659.
events, roma, Lions, GCS, IPS. Sports, community, Communities, federation, cis. 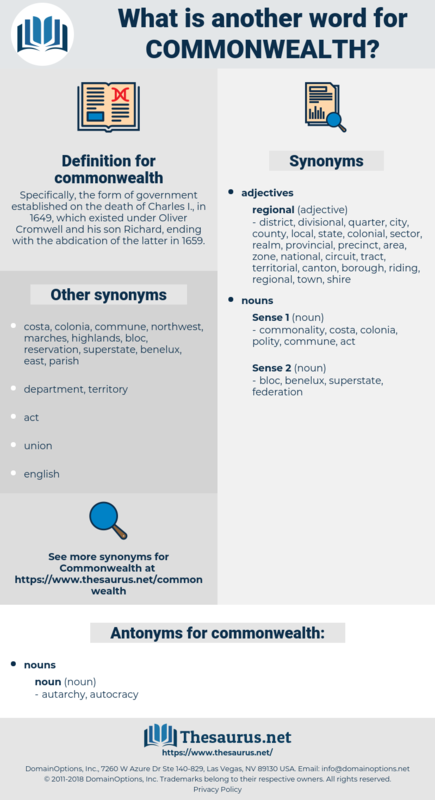 The square cap had been out of favour during the Commonwealth, and was not generally resumed. In 1792 the franchise was extended to seventy years, when the bridge was to revert to the Commonwealth. British Commonwealth, commonwealth of nations. International Organisation, World Organisation, global organization, world organization, international organization.